In July 2015, Victor Martinez allegedly broke into the home of Paris, a 64-year-old Air Force Veteran and Vandenberg Air Force Base employee, while she was sleeping, then beat her with a hammer and raped her. Eight days later, Pharis died in the hospital after blood clots formed in her legs. Victor Martinez and co-defendant Jose Villagomez are both charged with first-degree murder. Martinez and Villagomez are being tried in Santa Maria Superior Court with a separate jury for each defendant. On Tuesday, Ronda Simpson, a nurse who treated Pharis at Marian Regional Medical Center, took the stand in Martinez’s trial. Simpson, who cried during her testimony, said she knew Pharis had been raped, but the Santa Maria woman did not want to talk about it. The judge, however, struck the comment from the court record and instructed jurors not to take it into consideration. Under cross examination, Simpson testified that Pharis never complained of pain in her legs. Medical records show the blood clots in Pharis’s legs eventually led to her death. Simpson said she ended up leaving her job at Marian Regional Medical Center because of how her interaction with Pharis affected her. Another witness also cried on the stand on Tuesday. Loida Hernandez, a neighbor of Pharis’s, testified that she was asleep in her bedroom when she woke up to her son screaming that someone was in the house. While in tears, Hernandez said she instructed her daughter to jump from her bedroom window, go to the neighbor’s house and call police. Hernandez testified that she could hear Martinez rumbling through items in her kitchen when she screamed at him to get out of the house. Another neighbor later took the witness stand and said he found Hernandez hiding in his car. Finally, Santa Maria police officers delivered testimony, describing how they captured Martinez. The defendant was hiding in a wood and concrete pile when police found him, officers testified. Due to Martinez’s background, the Pharis murder case has garnered national attention. 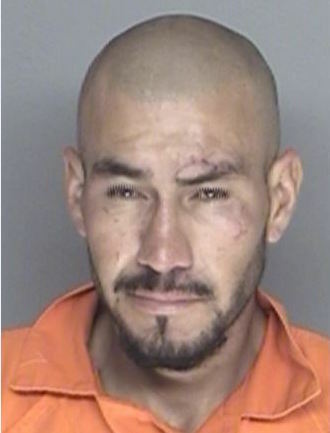 Martinez is an illegal immigrant from Mexico who had been arrested six times in the 15 months prior to deadly assault, according to the Santa Maria Police Department. Martinez was released from Santa Barbara County Jail 96 hours before he allegedly attacked Pharis. Earlier this month, President Donald Trump started a White House roundtable on California’s sanctuary state status with remarks about the murder of Pharis.